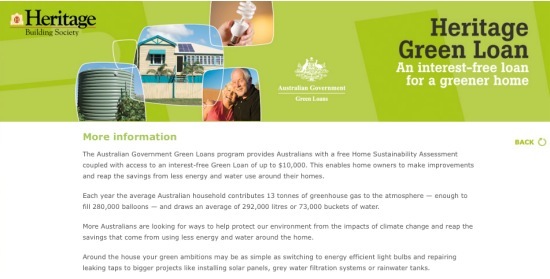 The Australian Government Green Loans program provides Australians with a free Home Sustainability Assessment coupled with access to an interest-free Green Loan of up to $10,000. This enables home owners to make improvements and reap the savings from less energy and water use around their homes. Each year the average Australian household contributes 13 tonnes of greenhouse gas to the atmosphere — enough to fill 280,000 balloons — and draws an average of 292,000 litres or 73,000 buckets of water. More Australians are looking for ways to help protect our environment from the impacts of climate change and reap the savings that come from using less energy and water around the home. Around the house your green ambitions may be as simple as switching to energy efficient light bulbs and repairing leaking taps to bigger projects like installing solar panels, grey water filtration systems or rainwater tanks.